Here is a preview of Ned and Penny's beach attire. Penny is actually wearing the same rashguard shirt as last summer and Ned continues to benefit from all the great clothes my friend Lori sent this Spring. Maybe next Summer I will plan ahead to buy items when they are in stores - I guess March for summer clothes. 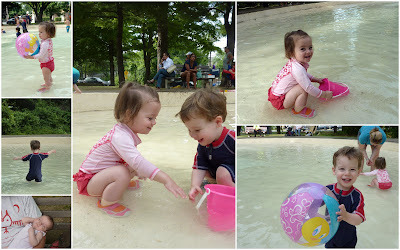 These photos were taken at a local "splash park" where I had the enjoyment of the first poopy swim diaper ever. Nasty. Also, did you know you should bring some toys? I didn't so these are courtesy of other children who has abandoned them (temporarily?) in the "pool". Click here if you want to see the photo collage larger. The summer of sickness continues - the three kids have been to the doctor's collectively 5 times in two weeks. I decided not to go for Penny's hand-foot-and-mouth virus since it was so obvious. We leave Friday morning at 6:00 am (goal time) for Day One of our two day trip to North Carolina. Wish us luck - and good health! HF&M is the worst. Just the worst. It was so so so so awful. Hang in there! Popsicles popsicles. Love the collage, the new header picture, and your facebook picture! and that was before I even realized I'm in the background of one of the pictures with Penny. Fun day! That splash park looks cool. Let's go there when Cameron and I visit in August? 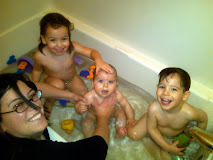 Poopy swim diapers are even worse when it is a reusable swim diaper. It happened once to us and now we wait until after Cameron poops before heading to the pool. Gah. I still have nightmares! they look like they're having such fun! 5 times in 2 weeks is brutal!